How does one write about a life-long relationship in just a few words? My 11-year-old son recently interviewed my grandmother about her life. She described a life of difficulties that are unimaginable to my son’s generation: survival of World War II, life in Siberia, existence as an orphan at a young age, oppression under the Communist regime, anti-Semitism and more. 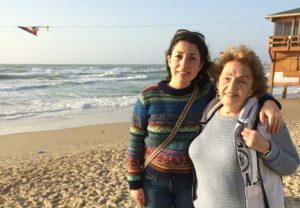 She made aliyah from the former Soviet Union at the age of 56, starting from scratch and learning a new language in which to teach physics and math. My son asked her the most difficult part about immigrating to Israel. Her response: “Nothing.” She didn’t think it was difficult at all. She was grateful for the opportunity. My grandmother is 82 now. I have visited Israel almost as many times as the years my grandmother has lived there, including longer stays to study in Tel Aviv and Jerusalem. Being in Israel helped me recover lost threads of my people’s history and atrophied parts of my own story. I collected whispers of heartbreak and yearning, lamentation and joy, fear and hope, pleasure and sin. I learned and relearned the language of my people’s ancient prayers, the language of their dreams and even the language of their neighbors. For me, being in Israel is coming home. It’s coming home to a place that has given my family new life and an identity based on a living, flowing and irrepressibly hopeful Judaism. It is a noisy, colorful, tight-knit home not without its secrets, old wounds and conflicts. As with all relationships, the one with Israel requires attention and the persistent choice to stay close.